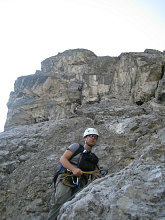 This page describes a good stout mid-grade ferrata: The via ferrate dei finanzieri (strange name...). Anyhow, the via ferrata dei finanzieri is, I think, a little harder than its grade would indicate. The actual ferrata portion is very long and often exposed, so if you are new to ferrate and you are unsure about them this is probably not your best choice. On the other hand, if you dislike those ferrate that have a good grade but are done in 20 minutes, then this ferrata is for you. The peak that the ferrata climbs is called "Colac". No Cima Colac, no Piz da Colac... just "Colac". It is a pointy, solitary peak, with lots of bigger and badder mountains around it. Most notorious of these is the highest mountain in the Dolomites, the Marmolada. From the summit you get a good close view of it. While the ferrata itself is good and long, the approach is not. From the community of Ciampac there exists a modern cablecar that can whisk you right up to the elevation of the ferrata start. 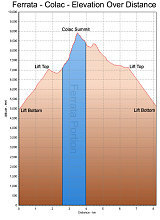 From there, it is a short mostly flat walk (I'd say mabye 15-20 minutes) to the start of the ferrata. You can survey almost your entire route from base to summit right from the top cablecar station. After walking the 15-20 minutes to get to the start, you are presented with a stoutly designed commemorative plaque and a short bit of ferrata, as a warmup. Soon after this is some steep trail (but no ferrata), and then the start of the real deal. From this point on, it is pretty much continuous wire protection right to the very summit. The route goes up lots of steep, smooth slabs with lots of exposure, and a few vertical bits as well (also with lots of exposure). Higher up it is a bit less intense and a bit less steep. There are stemples and ladders provided when the going gets really tough. This would be a much harder-grade ferrata without them. One other thing to consider is the possibility of knocking loose rocks down on people below you. This is definitely a possibility on this ferrata. After a long, long while, you reach one of the main ridges of the mountain. The route comes up through a small cleft, and then more or less follows along just below the ridgecrest to the summit (and the steepness is less along this section). Once you get to the crest, you are quite close to the summit. You'll quite possibly be glad of this, becuase you've just finished a very long bit of climbing! The summit itself is a relatively small area adorned with an antique-looking summit cross. There are superb views in all directions: to the Sella group, to the Marmolada, to the Padon ridge, etc etc. Descending the way you came up would be a tricky and unpleasant experience. Fortunately, however, there is a fairly easy way to get down: via an easy-grade, relatively short ferrata. Near the summit you'll notice a red-painted arrow on the rocks, point down the other side of the summit from where you came up. This is the descent route. It starts off with wire protection, never very hard, and descends off of the summit to the south. It is actually quite a pleasant and scenic descent. The route descends through various gullies until it reaches the steep grassy slopes surrounding the mountain. From here, it is a very pleasant hike around (clockwise) the base of the mountain and back into the broad ski valley where the cablecar station is located. After a short, pleasant stroll through the grass back to the cablecar station, grab your favourite drink at one of the bars there, then head back down! You can look up at the route you just did from your seat! Nice route - you feel you got your money's worth on this one!